Please note - this page is about the Version One European Connexion. I've kept this page simply becuase so many people have linked to it. 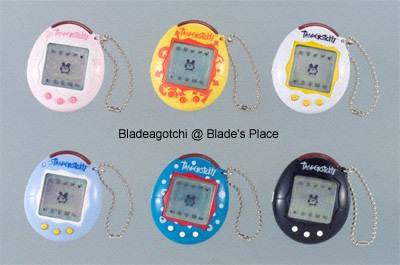 Tamagotchi Connexion was released in the UK and the rest of Europe with little fuss in late May 2004. So far, the same six colours as the original Japanese release have came out, and much to the delight of everyone, it can talk to all Version One Plus, Connexion and Connections...and can also talk with Version Two connections and connexions. All Version One Connexions, regardless of where they were released, have the same programming inside them. The only difference is the packaging, and that the instructions are in European languages. The first batch of colours, show below, are exactly the same as the Asia-Pacific colours. Many, many more colours have came out. 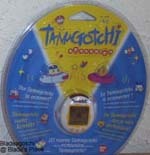 Europe is now onto the Version Two Tamagotchi Connexion, with a Version Three due out in March 2006.